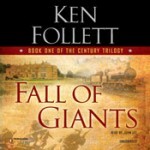 Once again playing catch-up on the books I have read this summer – I finally finished Fall of Giants by Ken Follett and enjoyed it immensely. I am a big fan of Mr. Follett’s work. From the iconic “Pillars of the Earth” to his thrillers like Eye of the Needle, and the excellent Night Over Water, Mr. Follett is a master story teller. Fall of Giants is not a breezy read, the story is epic and there is much exposition as the author is setting everything up for the entire trilogy to come. This first volume of the planned trilogy focuses on the early years of the 20th century through World War I. Like many Americans, I am not nearly as familiar with World War I as other conflicts in history. Although fiction, reading this book gave me a better understanding of what led up to the war, the true devastation that resulted from it, and the impact it had on the world for decades to come. This history is the backdrop to the lives of compelling characters Mr. Follett has created, from heroes to villains to everything in between, Mr. Follett presents a cast of characters seemingly independent of each other who inevitably cross paths. Again, not a mindless beach escape novel, but if you are looking for a novel that is entertaining, thrilling and rewarding – then Fall of Giants may be a good bet. If you are already a fan of Mr. Follett’s novels, then reading this is a must. Fall of Giants is available from Amazon and other booksellers. Lost Cowboy is powered by	WordPress 5.0.4 and delivered to you in 0.841 seconds using 40 queries.